There are no words that can sum up the evil visited upon the 12 victims in Paris today, sparked by satirical cartoons lampooning Islam. Those who use violence against innocents to try to prove a point simply lack the intelligence and rational thought to achieve their ends any other way. And so it is with the these terrorists. 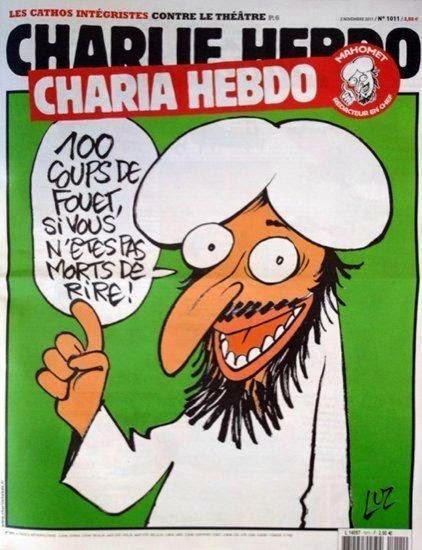 They were so offended (on behalf of a supposedly omnipotent and all-powerful being) that they decided to kill the people responsible for publishing a cartoon and anyone who got in their way. The response throughout the day once the news became widespread is yet more evidence that the pen can and will outlast the sword. There are some media outlets, however, who refuse to show the cartoon out of some kind of deference to those so misguided and simple-minded that they would take up arms against authors of a cartoon. These outlets include The Telegraph in Britain, the New York Daily News, the Associated Press, CNN, and NBC. To be honest, the overused cliche of "the terrorists won" is apt here. 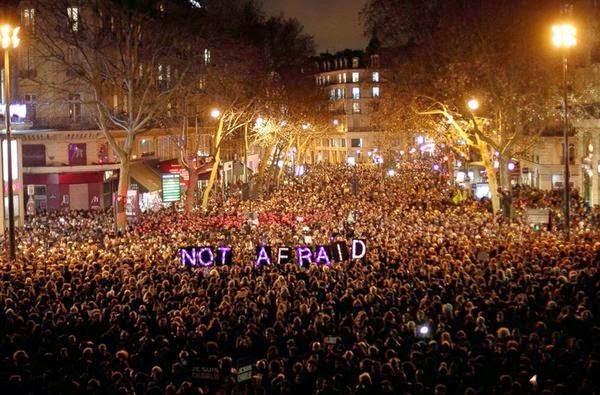 The Charlie Hebdo offices were attacked in a show of force against free expression and freedom of the press. The response ought to be a flood of this kind of expression, not its reduction. Here's the thing about religious choices and laws: follow them if you feel so obliged, but under no circumstances do people who do not subscribe to your beliefs need to follow them. If someone wants to eat pork, they should be allowed to no matter what the Talmud says. If someone feels like publishing a picture of a prophet, they should do it regardless of the hadith. For those who believe in civil rights, they fight for marriage equality no matter what the Vatican thinks. The great thing about freedom is that it goes both ways: You're free to follow whatever religious guidelines you choose; others are free to follow none of them. When we begin caving like this to the will of others's personal beliefs, we begin to erode the very principles that millions of people perished throughout history helping to progress us as a species. We begin to prevent others from expressing their freedom in deference to a vague notion of "offensiveness" for others. This is not acceptable in a society that declares itself free. There are two quotes with which I want to end this post. The first is from one of today's victims, Charlie Hedbo editor Stéphane Charbonnier, quoting Zapata when asked whether he fears retaliation; "I'd rather die on my feet than live on my knees." The other comes from satirical gold mine The Onion in their all-too-real article on the tragedy in Paris today: "At press time, although the consequences of this article are reportedly still unclear and actual human lives may hang in the balance, sources confirmed that the best thing to do—really the only thing to do—is to simply put it out there and just hope that it does some good."